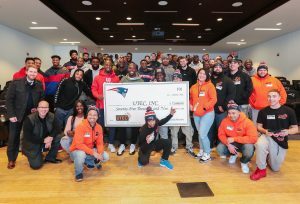 What started off with a trip to Gillette Stadium ended with UTEC, a Cascade Alliance Member, becoming the first recipients of the new Patriots Social Justice Fund. UTEC members arrived at Gillette Stadium on January 7, 2019, prepared to give a presentation about their organization’s mission to work with young people impacted by violence and poverty and help them achieve social and economic success. They arrived excited, expecting to present and build a partnership with the Patriots. They were given a tour of the stadium and make some passes with a football on the field. While it was must have been a thrill to tour the stadium and pass a football on the field, it paled in comparison to the surprise gift they were about to receive. Players from the New England Patriots surprised the members with the grant after hearing about the work they do. You can watch a video of the surprise by clicking here. The Patriots Social Justice Fund is funded by the players who also decide which organizations to award grants to. UTEC focuses on re-entry programming and street outreach to curb recidivism after incarceration. They’ve done great work leading mattress recycling efforts in Massachusetts and are also committed towards criminal justice reform. To read a full recap of the presentation, click here. Congratulations to UTEC and all the amazing work they do to promote change in their community!